If you own a Keurig® 2.0 coffee maker, you know you have to use authorized coffee K-Cups®. These K-Cups can get extremely expensive. You can pay upwards of $50 US dollars per pound of coffee when using K-Cups. The Keurig 2.0 has a reader in the top lid that only recognizes certain patterns and inks on the new K-cup lids. This is a DRM (Digital Rights Management) system that makes it so you are forced to only use the authorized K-cups. If you want to use any type of coffee in your Keurig 2.0, we have many ways to sort of “hack” the Keurig and make any coffee brew in your Keurig saving you loads of money. There is a clip hack that has been created by San Fransisco Bay Gourmet Coffee Company. This “Freedom Clip” for Keurig® 2.0 brewers simply clips into your brewer. It will make it so your Keurig can brew any coffee brew pod designed to work in a Keurig K-Cup brewer. You can buy a OneCup 3 pack that will come with a free Freedom Clip for only $1.99 and free shipping. Amazing deal, great coffee, and you get a special clip that makes it so your Keurig will brew just about any pod. Buy a few Fill it Yourself k-cups. Available online and are a few dollars each. See the refill cups below. Get the exact o knife and cut the lip of the cup by removing the top portion. Use your knife and get the top lid and cut out a half inch sized circle in the middle. This will let the needle and the water enter into it. Use your sandpaper and remove the plastic from the back of the top disk. Get your epoxy and glue the disc to the lid of one of the refillable cups. Once you have glued the lid on the reusable cup, make sure the glue is dry and the cup is washed and clean. Let it air dry. Next add your coffee to the refill cup and try brewing your coffee. coffee and brew. 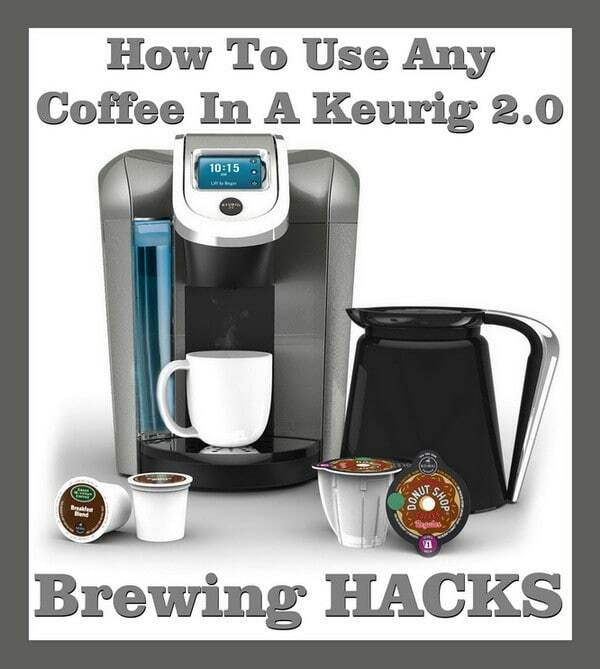 For more ways to do this, see the videos below to assist you in hacking your Keurig. See below for some highly detailed ways to make your Keurig 2.0 brew any coffee you choose without using the authorized K-cups. The Keurig 2.0 restricts competition and choice. This PERMANENT FIX will let you use ANY K-Cup with your new Keurig 2.0 Brewer. This hack is also compatible with the Solofill refillable Vue/K-Cup cups for those of use who prefer fresh ground coffee. Keurig 2.0 “Hollow Carafe” Hack Unlock 14oz cups and favorites. Simple hack for 14oz cup of coffee and favorites. 1. Insert the single K-cup and close the lid to pierce the bottom of it. 2. Take the K-cup out of the brewer. 3. Insert the Hollow Carafe. 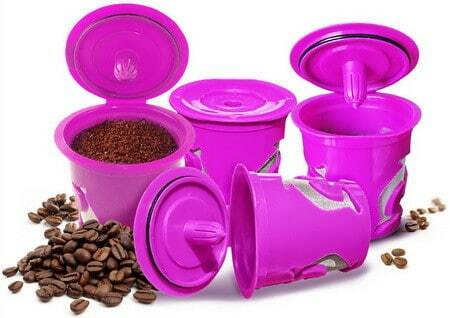 4. insert the K-cup inside the Hollow Carafe and close the lid. 5. Select section 2 and brew your coffee. Do you have other ways or methods to brew any coffee in a Keurig 2.0 brewing system? Please leave your Keurig hacks, tips, and tricks below. I HAVE A NEW KEURIG 2.0 BREWER AND THE COFFEE IS NOT HOT ENOUGH. CAN I UP THE TEMP? As of right now, you can’t choose the brew temperature on the newer Keurig coffee makers anymore. The brewer defaults to an average brew temperature of about 175 degrees for K-Cups and 180 degrees for Vue Packs & K-Carafe Packs. You can try to run a cycle of water through the brewer before brewing a cup if you haven’t used the coffee maker for a few hours. This heats up the machine and can make the water a few degrees warmer, giving you a slightly hotter cup. There may be a hack on YouTube you can try but it may void the warranty.